It’s after Memorial Day, which means that you can officially wear white until Labor Day thanks to the age-old saying. But why feel constrained? We say that it’s not only ok, but chic, to wear white year-round. Intimidated? Don’t be! White-on-white is easy to wear and looks crisp, clean & sophisticated. Here are three looks—with tips to boot—to inspire you to wear white now. 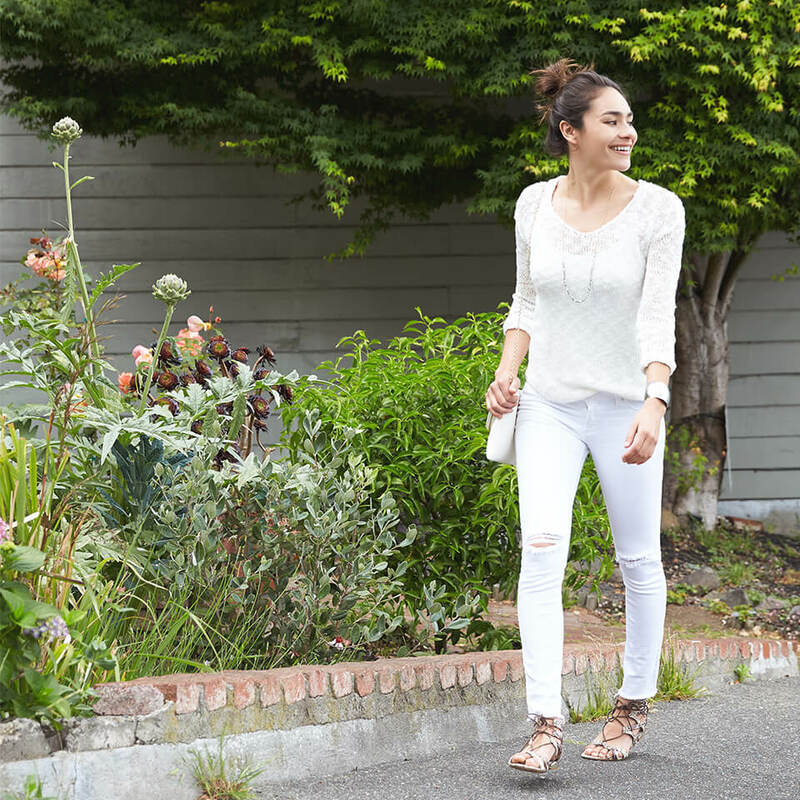 If the temperatures in your town have yet reached summer status (we’re talking to you Bay Area), then opt for a lightweight, airy sweater and your favorite crisp white denim. Stylist Tips: Keep your look monochromatic by adding silver accessories instead of the more contrasty gold. If you’re feeling playful with your shoes, try printed flats or cognac booties. An easy, warm-weather go-to? A simple, eyelet dress. We love a one-and-done outfit that spans casual to dressy so easily. Stylist Tips: A 100% cotton dress, like this one, is so breathable—ask your Stylist for natural fibers to keep you cool. For footwear, pair with neutral, strappy sandals or even leather flip-flops. Discover more breathable fabrics for summer. When the mercury starts to climb, and you feel like it’s going to be one of those days, a great shorts & tank outfit is the perfect solution. Stylist Tips: Bermuda shorts are a great length for any height, and versatile enough for most shapes & sizes. Keep your accessories simple—when it’s that hot, all you really need are sunglasses. Want to try out summer whites? Pin inspiration for your Stylist on your Stitch Fix Pinterest board.